I often save seed from a number of plants in my garden. There are plants that I do not save seed from. An example would be carrots, I do not save carrot seed for a few reason’s, I have wild carrot (queens anne’s Lace) on the farm that it would cross with. I also do not want to overwinter enough carrots to keep my population breeding gene health, nor do I want to give up that much space in my cold cellar to keep carrots that are not going to be eaten as carrots are a bi-annual seed plant. Some plants are very easy to keep seed back from.. Pea’s and Beans are some of the best starter seed keeping plants.. Squash and or pumpkins fall somewhere in the middle.. They seem like an easy plant to harvest seeds from. Get ripe squash or pumpkin, cut carefully, split open and take out the seeds, wash/dry them and use the next year.. See simple right? If you only plant one type and you are far enough from the gardens around you, then your seeds will remain pure on their own, but for most of us on homesteads we are growing more than one kind, and for those in towns or in community gardens. There will be other kinds around. This means you need to either use a pollination cage or you can just hand pollinate and then tape the flower closed. For most folks its just easier on pumpkin or squash to do the hand pollination, pick off a male flower, or male flowers and take it to your new, just ready to open female flower that you have been watching develop, you will need to do this early in the morning, then use the male flower to pollinate the female, once you are done.. take painters tape (or other kind of tape can work) and close up the top of the flower, you must tape the flower so that no bee’s or other bugs brings in other pollen. The flower and tape will drop off once the fruit starts to grow properly, make sure you know which one of your fruits are the pure vs the ones that are nature pollinated.. you can at certain stage very gently mark the skin of the pumpkin, I prefer to use a different marker, I use certain tiles for pure pumpkins to sit on and a different kind/color for the natural crossed. Pick your perfect pumpkins to harvest from, make sure you like the color of the shell, the structure of the pumpkin, the color, texture and taste of the flesh. Here is where it becomes a touch more interesting.. do you want to save seed from the first pumpkins that are ready? 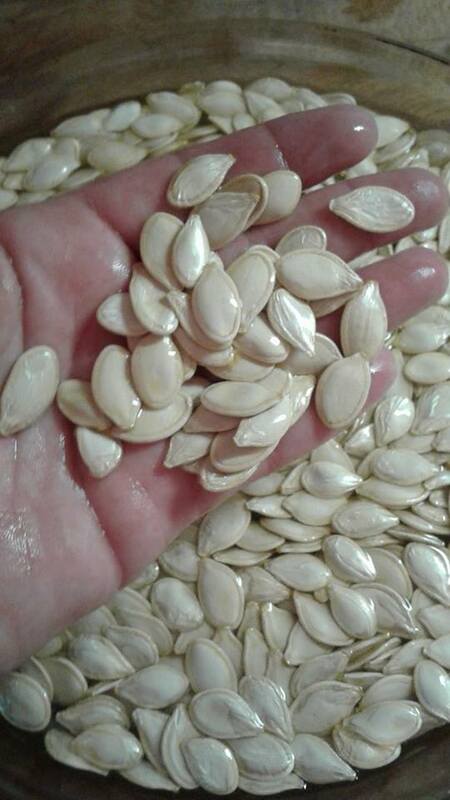 or do you want to save seed from the pumpkins that are at the very end of the harvest season. Now I am not talking about the difference between when the fruit was set, there are lots of times when you have pumpkins or squash done in the same week that will develop and mature weeks apart even on the same plant. 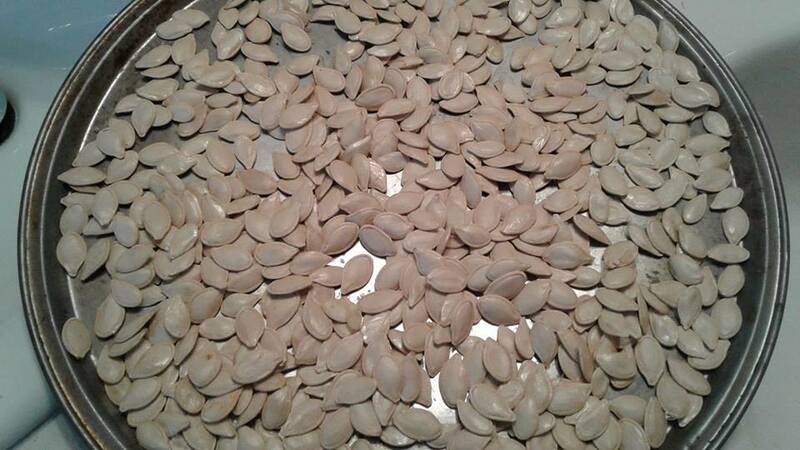 What you choose on a yearly base will affect your seeds.. if you are always picking and saving seed from the earliest mature pumpkins, you will slowly but surely working gene wise on a shorter season pumpkin of that type. Of course there is a limit on how far you can move something but as we all know on seed packages.. the amount of days can be quite different.. ranging from 90 to 140 days. If you have something that is normally ready in 120 days, if you are always picking the fruit that is ready as early as possible, you might get one that is ready at 118 days or one that came ready at 122 or the rare one that was ready at 116. and you saved seed from them , then the next year you plant them and breed them together, that year more are ready by day 118 to 121, and then repeat and repeat.. it takes 3 to 5 years to set in a new date typically of one more day. So its possible that your first bought seeds would be ready at 120 but three years later you can have used selection pressure to move that to 119 and three years later to 118 and ten years later you might have pushed it to 115 days. If you are in growing in a season that is short ended for the type of plants you are growing to have a plant that you like move to a short season by five days can make a big difference depending on your early frost date. On the flip side.. watching for and breeding for the late side is important as well.. working to see if you can breed in a bit more cold tolerance is a good thing for a number of types of plants. So with the above in mind, I selected the two pure pie pumpkins that were ready first to save seed from. I cleaned the basic seed out of the pumpkin. Then I filled the pan with water and let other bits float to the top, empty seed pods also float, remove them, if anything is stuck to the full seeds, help wash it off. Check the seeds, pick two or three nice full ones and open them.. confirm that you have a mature seed in there. Then look at the rest of the seeds, remove any that odd shapes to them, a dip in the side.. remove it, one that is very narrow compared to the rest, remove it, anything that feels light in weight, remove it. The ones that are left should go on trays or screens to air dry. Do not put your seeds on paper towels, there will be tiny bits of paper left on the seeds when you take them off the paper that can affect them in a negative way. Allow to dry for 12 hours, then shift them around and continue drying for another 24 to 48 hours.. it could be longer depending on time of year, heat in the house and how humid it is.. clearly a warm sunny day vs a rain day will affect how things dry in your house. Keep drying them until they lose their sheen and become a duller flat color and they will slip though your fingers in a smooth way, if they catch at all.. they are not dry enough..
Once they are dry.. look at them again.. things that were not visible when they fresh will show now that they are dry, remove any that have broken edges or show large dips in them.. keep only smooth, full seeds. Move them to a paper bag, label the bag and place in a cool dark cupboard for winter storage. Thought you were done.. Nope LOL Wait a week and then run a seed test.. take five seeds and use the baggy method and test them, they should sprout quickly and fast.. check your sprout amount.. you are looking for at least 80 to 90 percent sprouting results. If you have that.. great.. you are good for the year.. keep your seed, remember to do your seed test again in the spring before planting.. this will give you info on how well your seed storage is working for you. there is no point in keeping seed that will not produce for you when planted and you will also need to know to add that seed to your seed buying list. However if you have run the seed test, you know you have good seed going into your seed saving box. In my case, I do not need this many pie pumpkin seeds but I am planning on packaging a number of them up for the local seed swaps that happen in my area. This entry was posted in Garden and tagged Pie pumpkins, Saving Pumpkin Pie Seeds, Seed Saving. Bookmark the permalink.